Rev. 4:4 "twenty-four elders in white with crowns of gold." No, none of those are the 4+20 I'm thinking of. 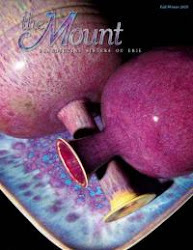 This is for those of you who haven't been able to visit our place, Mount St. Benedict, for at least 24 months! These are things you haven't seen, well, maybe in photos, but not live. So I'd like to bring them to you every week with hopes that you will be able to see them for yourself soon! Since we seem to be having our entire winter season of snow in the end-of-winter month of February, it is only fitting that the first entry to this series be our new side door sidewalk! After years of annually having to repair/replace cement on this sidewalk because of water/pothole breaks and cracks, not to forget the falls and near falls of everyone trying to negotiate 75' of snow-covered, icy ground on the way to and from the side parking lot...we opted this last time to replace it rather than repair it, with one that we could heat after snowstorms. This is its first winter and VOILA, it has been a marvelous success: no falls, no cracks around every pillar, no chunks erupting from ice forming underground. Terrific all around--and hopefully a long-term good savings in the years to come. I include our favorite little birdhouse--which is located along this sidewalk--after our most recent heavy snowfall. Yes, it is inhabited all winter!